Make the bear boy or girl? 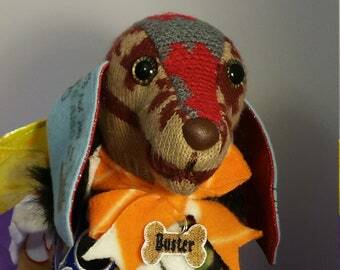 Enter embroidery for the 2 paws here. Limit 3 lines and 15 characters per line on each paw. 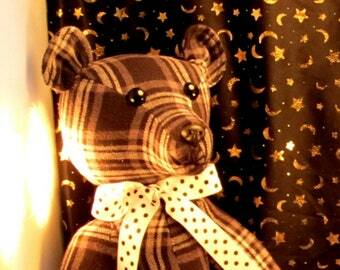 Handmade 17 inch Memory Bear is fully jointed so that he can be posed. Looking for something unique to give to that special person? How about taking a personal piece of clothing and making it into a bear? Maybe you have lost someone close to you, or maybe you just have a great vacation or other event in your life to remember. 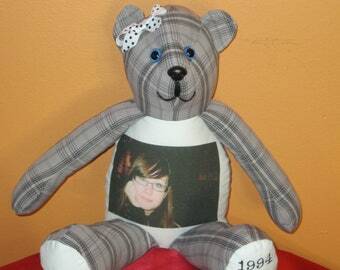 Turn an article of their clothing or that t-shirt from your trip into a keepsake bear. What a wonderful way to remember them or that special time. I have been making memory items for the public since 2003. 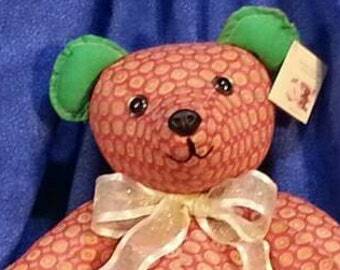 I have been a featured artist in "Teddy Bear & Friends magazine in 2012, 2014 and 2016. I promise to treat your items as if they were as precious as gold because they are. Pictures get ruined or easily lost, so why not have a bear that you can hold? Memory Teddy Bear 21 inch fully- jointed with FREE embroidery on the paws. 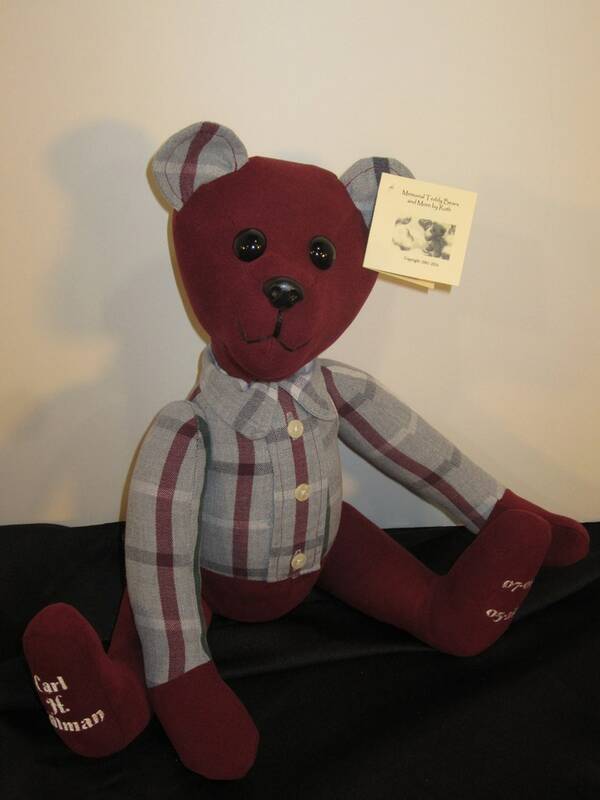 Memory Teddy Bear - 15 inch fully-jointed - FREE Embroidery on the paws - made from your supplied clothing. Memory Teddy Bear 12 inch seated. FREE embroidery on the paws. Make a memory with a teddy bear. 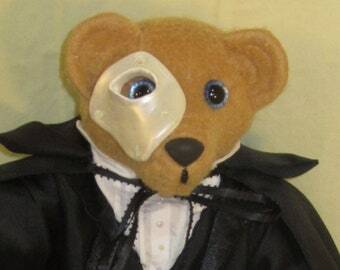 Phantom of the Opera Christine Teddy Bear, Musical Teddy Bear, Limited Edition Teddy Bear, 15 inch fully jointed teddy bear. 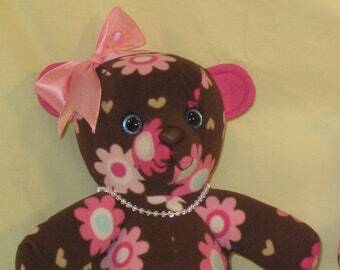 16 inch Memory Bears made from your supplied clothing (FREE Embroidery on the feet) Keepsake memory bear. 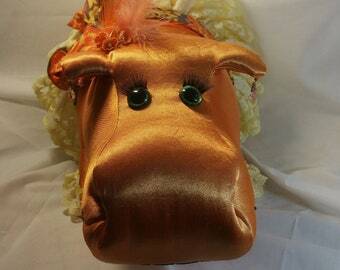 Hippopotamus memory animal hand made from your supplied fabrics. 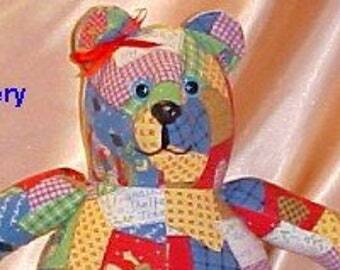 The bears are beautiful and professionally constructed. This is my second order. Order is delivered as promised and beautifully packaged. I would recommend Ruth to make your memory items. I purchased this as a gift for my daughter. I'm sure she will always treasure this teddy bear, Phantom is her favorite play. 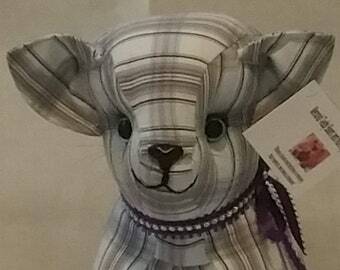 I love this teddy bear, it's too cute, the attention to detail is awesome, I received it sooner than expected. Thank you so much Ms. Ruth!! It's gorgeous and the detail is incredibly good. Should arrive in the UK soon and I can't wait to see the reaction of the recipient. 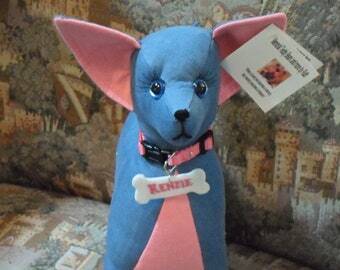 We accept Checks, money orders, credit cards, PayPal and of course Etsy Payments. Cancellations are not accepted without a fee of 25% being incurred. As we begin making items such as eyes, glasses etc. As soon as your order is placed. Because of the nature of our products as a general rule refunds are not given. But will be considered on a case by case basis. All items are insured when shipped to cover damage and losses. All items are shipped and insured through the Post Office using Priority Mail or if too large then UPS. Please allow enough time for your items to be made. Especially during Holidays! We get very busy between July through December. The guaranteed Christmas delivery order cut off is October 1st. Never a problem, just please keep in mind that all custom orders require extra time to be finished. Memory Pillow with or without poem made to order. 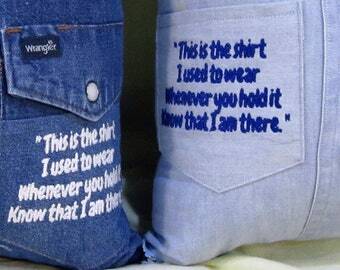 Memories made from your supplied clothing. Masque of the Red Death. 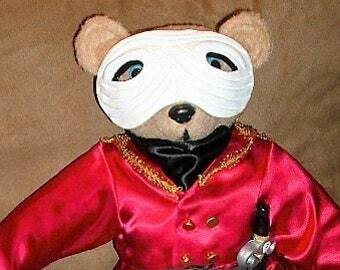 Masquerade musical teddy bear. 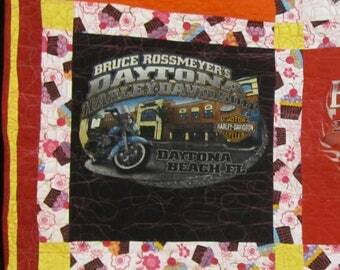 Custom handmade lap size memory t-shirt quilt. This quilt is made using 6 t-shirts. Other sizes available - please ask! 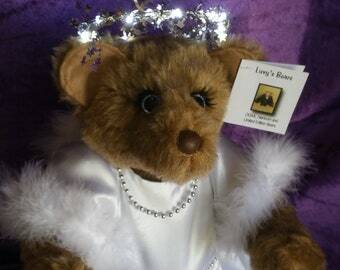 Musical Angel Teddy Bear with lighted halo, maribou feathers and silver trim.